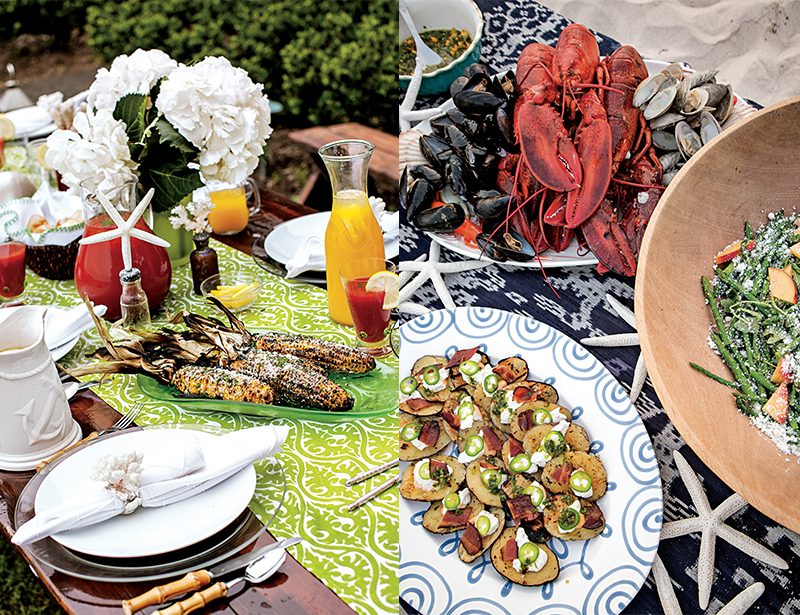 With the release of her first cookbook, Smoke & Fire: Recipes and Menus for Entertaining Outdoors, it’s clear that Holly Peterson knows how to throw a summer party. The author and journalist swears that food tastes better when it’s cooked outside. The book is bursting with Holly’s own recipes as well as those garnered from friends like the celebrity chef, Katie Lee. I talked to her about the inspiration behind Smoke & Fire, and got some tips for entertaining al fresco. 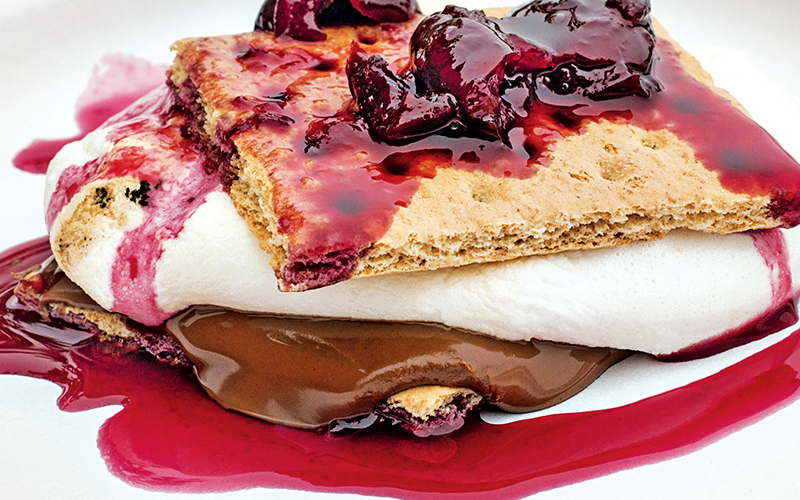 Smoke & Fire is filled with easy recipes, beautiful photographs, and engaging anecdotes. It’s like a love letter to summer. What’s your favorite foodie memory from summers past? About ten years ago, I started surfing with my then nine-year-old daughter and she and I fell like Alice down a hole to a water wonderland. I started surfing every day and bought an old pick-up truck so I could drive my kids and their friends onto the beach. We’d surf until sunset, then change into warm sweatpants and make dinners on the beach as the moon rose. I cut the legs off a bar table and we sat at it on Indian throws. We still do this all the time. We have red metal camping lanterns, and always use metal forks and knives and flecked metal cowboy plates. I bring my big old trusty Weber grill in the truck and we make steaks and spinach salad and baked potatoes covered in olive oil and salt. That’s how I started cooking outdoors. After perfecting that type of dinner, I was game to cook more on docks and do crab boils and grilled Parmesan crusted street corn. Then I got a pizza oven and basically lost my mind with ducks and apricot glaze and gooey cheesy potatoes crusted to perfection, and peaches roasted with fresh ricotta and mint syrup. I thought, I need to turn this outdoor cooking obsession into a book, which was how Smoke and Fire: Recipes and Menu’s for Entertaining Outdoors was born. You regularly get together with a group of women who are fellow surfers. What’s your must-have cocktail when entertaining at home? I started surfing regularly in the Hamptons with many women, including chef Katie Lee. Katie welcomes so many different people to her home to enjoy her backyard brick oven extravaganzas, where she fires up everything from pots of local clams and mussels brewed with Long Island white wine, tomatoes, and garlic to glazed summer fruit desserts. She and I both love to serve a signature cocktail at our events. Her pink grapefruit margaritas are fantastic and lend such a festive flair. I prefer wine and champagne drinks, so we also serve Sangria with sliced fruit, which is a little lighter. Here is a link to a Mexican surfer chick night with Katie Lee from my book that details ideas and recipes: perfect guacamole, spicy fish, and skirt steak tacos, creamy citrus slaw, and of course, pink drinks and fruit-filled sangria. You have included many of your friends from the food industry in your book. What was your approach? A lot of people love to cook, but very few can create wonderful recipes worth sharing. For this reason, I decided to highlight other chefs in each chapter, interview them, and include their recipes. I very much wanted this book to be unfussy—fancy seated dinners are kind of passé in my mind. No one wants to sit for so long, everyone wants to roam around a party on their own terms and eat delicious food in a casual way. That’s why my dear best friend from nursery school, the comedian Ali Wentworth, made her famous WASP crab dip for a crab boil on the docks of Peconic Bay. She and I both love to put strings with chicken legs into the bays out here in the Hamptons to catch buckets of crabs, and then boil them up with Old Bay Seasoning. Do you have any tips for cooking and serving food al fresco? Keep it simple, and prepare as much as you can ahead of time so you can enjoy your guests. I have a great list for lobster bakes on the beach. No one really cares about the fanciness of the food as long as it tastes good. 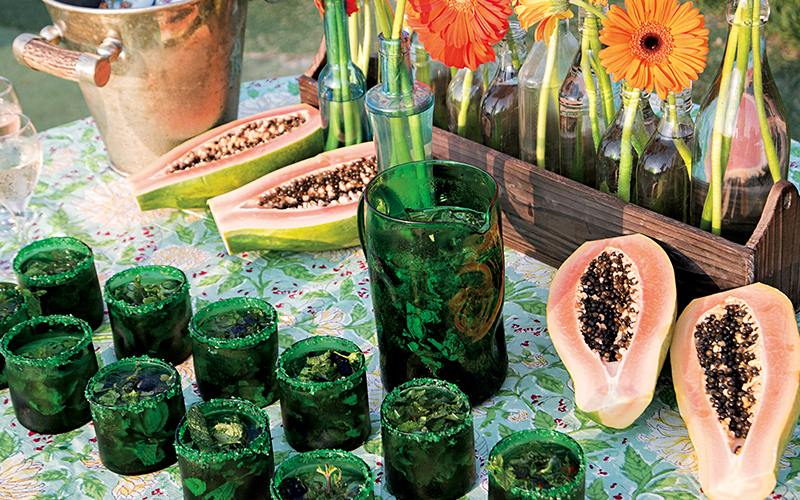 There are simple tricks to make your table extra special. I like to char lemons on the grill because they make a terrific accompaniment to dress up any dish, as does fresh sprigs of lavender and rosemary. The book is meant to inspire and not intimidate. All of the recipes work well in a regular indoor kitchen, but they taste better when fired up outdoors under the setting sun with those you love most. 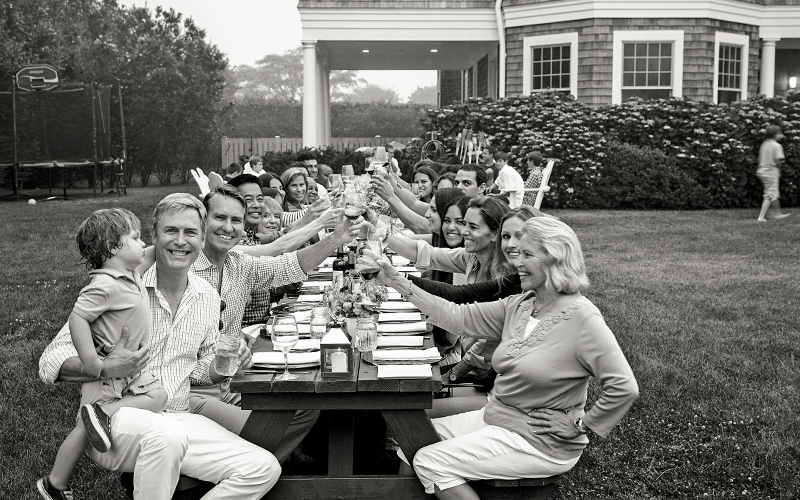 One of your most magical dinners was a table you set up at Duck Walk Vineyards on Long Island’s North Fork. Tell me about that night. Last summer, I discovered a surefire way to enjoy my friends without having to spend too much time tending flames and food: a La Caja China Box. As Labor Day approached, my friend, the great chef Tom Kukoly and I planned a Cuban sunset evening at Duck Walk Vineyards in Long Island. Tom is a fabulous chef from Georgia, classically trained in Europe but specializing in flexibility and outdoor whimsy. While we tasted delicious local wines, the owners allowed us to place the Caja box on the safe cement back area and let our sour orange and garlic-marinated chickens roast away until the color matched the glowing August sky. What’s the mark of a great party for you? It is most important for the hostess to relax because your guests take their cue from you. Ahead of time, make sure you are organized and feel in control. I put out a full bar and wine buckets for guests to get their own drinks. I always bring food out early—some in big, often mismatched dishes—before guests arrive. I am often hungry when I get to other’s people’s homes and wonder when dinner will be served. My guests must feel the same when they come to my house; they are tired from kids and work. So I have a cardinal rule that I’d like to spread to every hostess around the country: bring dinner out early. If people want to linger after desert and stay all night, they’ll do so on their own terms, fully satiated. You’re donating the proceeds from this book to Feeding America, a non-profit food-bank network. I’d love to know more about it. I thought while I’m writing about getting family together, why not help others? Stocking food pantries is the easiest way to help those in need: you can donate your time and help deliver food, you can organize can drives at your place of worship or school, or, if you have any funds to give, you can give to them. All of my author proceeds go to Feeding America, a nationwide network of 200 food banks and 60,000 food pantries and meal programs that provides food and services to more than 46 million people each year. 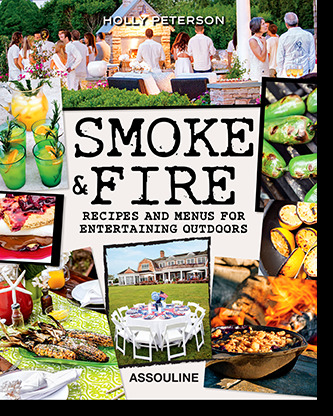 Smoke & Fire: Recipes and Menus for Entertaining Outdoors is published by Assouline.